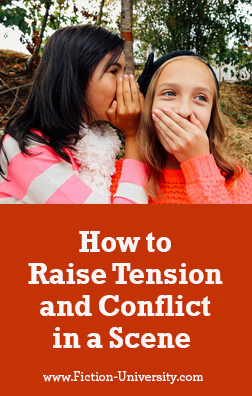 Tension is a valuable tool for getting readers to turn the page--no matter what genre you write in. Here's an updated look at a great tip for creating tension. Conflict and tension are two things writers want in every scene, but it can be rough getting them both in there without a fight. Characters can't always be at odds or butting heads, and "conflict as a fight" gets old pretty fast. Even a solid difference of opinion can only happen so many times before it starts to feel repetitious. It's also tough to find new ways to build tension when the characters in the scene are friends working toward the same goal. How do you create conflict and not have friends turn on each other? People don't tell each other everything, and even friends and family hold information back. Sometimes that information is important, but often it's just embarrassing or personal. Variety and unpredictability keep readers guessing, and the more they guess, the more desperate their need to know the answers will be. Characters kept in the dark can help us achieve this in our stories. This is a trick I started using on my spy fantasy, and have been living by it with my current detective novel. In every scene my characters were either keeping secrets or there were critical things they needed to know to make the decisions they needed to make. Often readers knew more than the characters, which raised the tension because they could see the horrible path the character was heading down. Readers knew it wasn't going to end well. 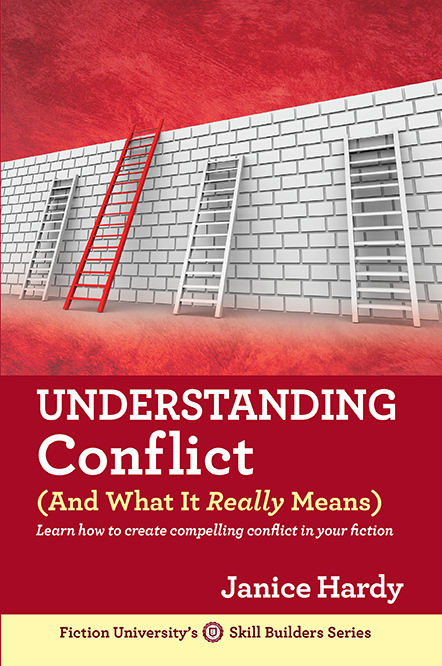 What the protagonist doesn't know works on multiple levels to create conflict and tension. From a plot standpoint, things a character doesn't know can aid you in figuring out where to send them next. What they still need to learn, or what goals still need to be met. It can also help remind writers to write the characters as someone in that situation would behave, letting them choose the wrong path or charge into a bad situation instead of acting out what's supposed to happen. From a character standpoint, it allows them to misread people and make mistakes, it can make them suspicious of actions, or if can make them doubt themselves. They can assume one thing when the opposite is really true. They can act before they have all the information. It also allows you to plant red herrings and set up surprises later. Not knowing something is a great way to misdirect readers. From a reader standpoint, it can add new twists and surprises to a scene. Readers might expect a scene to unfold one way, but what they don't know is a secret someone is keeping that changes the entire scene (and maybe even the book). From a goal standpoint, trying to uncover secrets or learn vital information could be a strong motivation driving your protagonist to act. This has been especially true in my detective story. Characters need to know what's going on and what it all means, same as readers. When you're writing (or revising) a scene, think about what the characters and readers don't know. What secrets are the characters keeping? This could change how they act or how they'd influence others to act. If someone avoids a certain topic, both readers and the other characters could wonder why. What don't they want the other characters to know? This could suggest secrets to reveal that change the scene and surprise the reader. A simple act could have huge consequences. If Bob goes into Sally's backpack for extra ammo and finds something critical she said she'd lost, readers suddenly wonder why she lied and what Bob is going to do about it. What is going on outside the scene that they don't know? If you know the bad guys are barreling down on them, you might toss in some foreshadowing hints or suggests that things are not right to make the reader start to worry. It could also help you think about what the antagonist or other characters are doing so the world feels like it continues even when the focus is on the heroes. Are the bad guys preparing? Mucking up the works so the heroes run into trouble later? What don't they know? Just the simple act of asking this can start you thinking about possibilities. What backstories or potential complications could the secondary characters have? What basic, totally predictable events in the scene can be changed to add a surprise that might deepen the plot? What character arcs for secondary characters might be created if the protagonist learns something unexpected during something mundane? What might happen that would cause a reader to say "Wow, I never saw that coming?" Often it isn't what a character knows that hooks the reader. It's what they don't know. 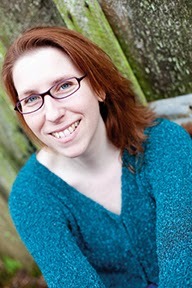 Are there surprises in your novel or is the plot unfolding in a potentially predictable way? Great tips Janice. Thanks for sharing them. Ooooo! I like this. I have already done some of these, but you have opened up new avenues of tension building. Thanks! Definitely something to think about. Great post. Leading the protag(s) into tense situations the reader knows in advance is a really great tip. How do you do this if you're writing in first POV? Another great set of tips and ideas. I must have at least 50 of your articles bookmarked on my browser. Keep up the great work, Janice. AJ, with first person, it's more a matter of knowing what everyone else is thinking and hiding, and then writing them that way. The POV won't know why they're acting strange, or being evasive (or however you write it) but they'll know something is wrong. Have you ever known someone who you *knew* was hiding something? You could tell by how they acted, what they did or said. The goal is to get all those hints into the story so the reader can pick up on them. lots of ideas as we write. Ooo I love a good secret - but this was a reminder to use it to best advantage. Especially as far as misunderstandings and doubt. I'm working on a tricky scene where one person's (secret) backstory is causing her to act a certain way. Hopefully some of these points might help me work it out. - Thanks! Thanks guys! Raewyn, good luck on your scene! Love to hear how it turns out.